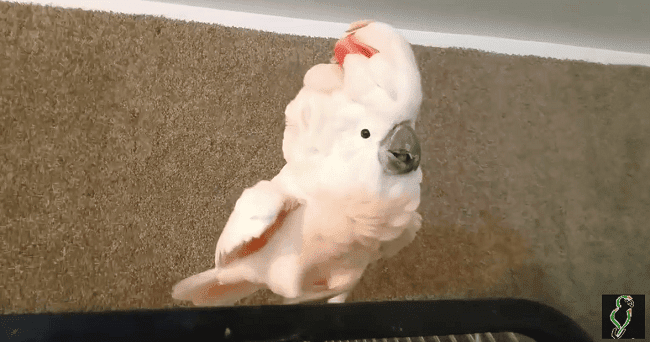 One of the loudest, most noisy animals in the whole entire world happens to be a Cockatoo. The vocal birds evolved their shrill sounding voices for survival related reasons as the distinct calls are what helps them to communicate with fellow Cockatoos in the wild. Loud mouths aren't the only thing the parrot species are known for, they're also highly intelligent animals who love to talk. The ones that spend time around people often pick up human words and will repeat the ones they hear the most often. That's not always a good thing because Cockatoos are also screamers, when they talk it's like they’re yelling. If they pick up a naughty word, like a curse, expect to hear it often! The outspoken bird in this clip named Pebbles is a case in point. Be forewarned, she curses like a sailor and has a lot of impolite things to say. According to her caretakers at the Saskatoon Parrot Rescue up in Canada, before they took her in she had lived in approximately 10 homes over the last 20 years or so. Somewhere along the way she learned how to swear and the rest as they say, is history. Pebbles had been enjoying the day outside of her cage and clearly didn't want it to end. When she was asked to get back inside of it, she threw a temper tantrum and had a major freak out! The beautiful white feathered girl acted like a diva as she flapped around and stomped back and forth on top of her cage. She noisily protests everything from her cage to the veterinarian and more. However, not everything she has to say is so negative and foul mouthed. At one point in the video she can be heard saying something that sounds like “I just like rock and roll” and the video comments seem to confirm this. Check out her wild and crazy rant and see what you can decipher from it!! Pebbles would get along quite well with another famous angry bird, Eric the Legend. He's a bad boy who also does lots of naughty things, like curse at all the other birds in his neighborhood and the poor family dog. They both have some of the biggest attitudes around and love to yell out swears like they just don't give a hoot!